According to the Trust Equation, it is to decrease your self-orientation. Note the equation itself posits the S factor as the most powerful by virtue of its solo location in the denominator. High self-orientation decreases trustworthiness, by the formula; low self-orientation increases it. Self-orientation comes in two flavors. The first is selfishness: a sense by the other person that you are in it for yourself, not for them. The classic stereotype of the conniving salesman fits this version of S; so do con artists. And, for the most part, infants. But the more common version of self-orientation—the daily, garden variety, neurotic form—is simply an inability to get out of one’s own way, a tendency to see others’ actions in terms of their impact on us, a constant worry about how others perceive us, a concern that others are talking about us—or, perhaps, that they’re not talking about us. What happens when we’re preoccupied by the noises between our ears? We are unable to connect with others, unable to hear them, and therefore unable to genuinely convince others that they have been heard by us. •	When presenting in front of groups, high S traps us in our own fear—we look preoccupied, and don’t connect with the audience. •	When in a sales call, high S means we are pretending to listen—faking head-nods and non-verbal verbal’s—all the while focused on planning what we’ll say when the other person stops talking. And the customer knows it. •	When advising a friend or co-worker, high S manifests in recasting the other’s situation into our own historical frames of reference, rather than devoting ourselves seeing the other’s viewpoint. •	When in a romantic or parental relationship, high S manifests as annoyingly controlling, as acting against an implicit promise of commitment to the other. How to improve trust? Get off your S.
(Thanks to Andrea Howe and Byron Hanson for the catch phrase). Focus on others. Do things for other people. Get curious about people around you. Listen. Learn to love silent pauses. Stop matching others’ vignettes with toppers of your own. Give up trying to control others. Live in the process, not the outcome. Recast your advice as simply your own experiences. Serve others. If it’s the right thing to do, recommend a competitor. Put a quarter in a stranger’s parking meter and move along. Paradoxically, stop trying to get people to trust you. Just put your time where it can most help others. Paradoxical, because a byproduct will be that others trust you. Because you have become trustworthy. Worthy of trust. To measure your own level of self-orientation and learn how to improve your trust quotient, go to my free online self-assessment, the Trust Quotient Self-Diagnostic. 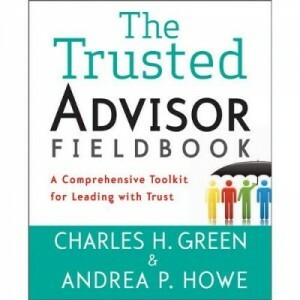 https://trustedadvisor.com/public/ 100 378 Charles H. Green http://trustedadvisor.com/public/trusted_advisor1.png Charles H. Green2008-05-08 10:00:002011-05-09 13:00:09How to Increase Trust by Getting Off Your "S"
May Carnival of Trust Is Up Is “Brand Trust” An Oxymoron? The may carnival of trust is up.